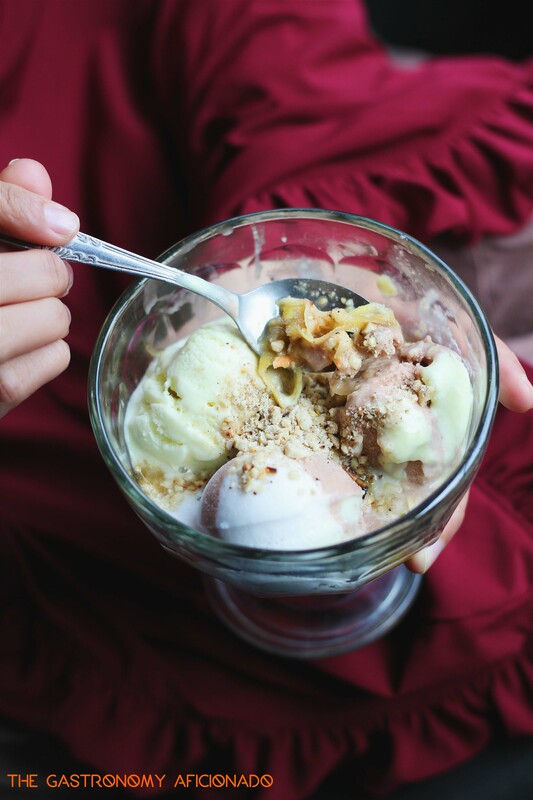 Indonesian homemade ice cream is always a nostalgic dessert to try from time to time. How about when it is combined with rujak or es podeng? Pak Mamat has the right recipe for you try! Pak Mamat was busy helping his fellow hawkers with their merchandises. At times he would serve people who want to buy the gorengan (Indonesian fritters) and also getuk (cassava-based dessert) whenever he’s free. When I came around to talk, he was more than enthusiastic when it comes to sharing about his rujak es krim business. It was a confidence that I rarely see from other people of his business. Street food oftentimes comprises of people coming from simple background and with the purest intent to survive and feed their family by selling popular food. 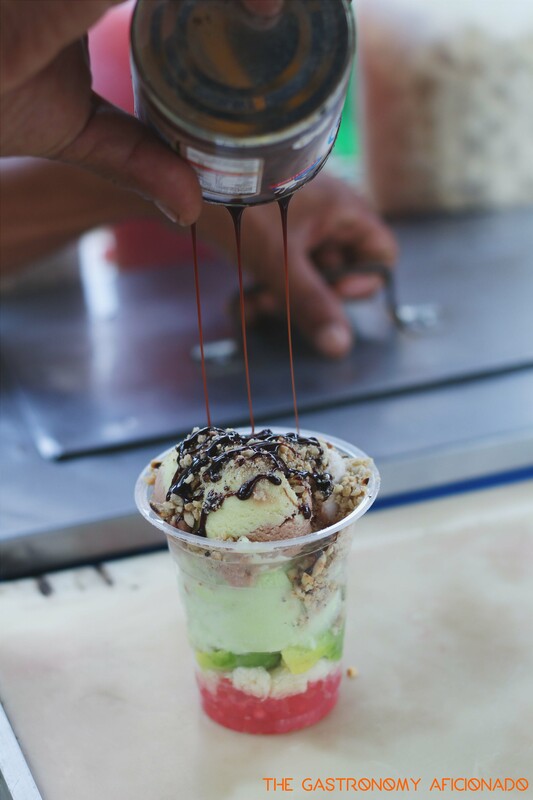 They are often shy and closed when asked about the business, but with Pak Mamat, his confidence shines just as bright as what he offers with his rujak es krim and es podeng. Initially he was only selling ice cream and successfully running to as many as 24 pushcarts around East Jakarta. It went to decline and afterwards he decided to marry his ice cream recipe with Yogyakarta-style rujak as taught by his former business partner. As time goes by, Pak Mamat successfully honed the taste and the quality as well. His creative take was credited from his curiosity in learning and experimenting every day while also having the privilege to be recognized by important Indonesian cuisine icons such as William Wongso, Bondan Winarno, and also Arie Parikesit. From them, he learned how to not compromise quality at all despite of the ups-and-downs of the ingredients’ prices and that several modifications were needed in order to reach an acceptable taste for many but also unique at the same time. His version of rujak tujuh bulan that comprises of sliced young mango, jicama, ambarella, carrot, and cucumber was all mixed masterfully with secret ingredients and terasi (shrimp paste). This created a complex flavor of freshness coming from the good quality fruits and vegetables as well as the sweet and spicy notes. While the terasi may taste subtle but it gave a whole different dimension to the rujak itself. The most unique thing I found was that he combined the rujak with three flavors of homemade ice cream from durian, chocolate, and coconut. Now, you might want to add more sambal to make it spicier but this alone is already an adventure of its own. Imagine such complexity found on a single bowl of paradise like that! In addition to that, Pak Mamat sells his version of es podeng that comprises of simpler ingredients but more colorful than the ones that we often found on the streets. For this, he uses diced bread, pacar cina (agar-agar shaped like pearls), roasted peanuts, sliced fresh avocado, and four flavors of ice cream. The fourth flavor is apparently avocado ice cream and that was a must-try experience for everyone! Now Pak Mamat spends his time running his business with this humble pushcart in front of Apotek Rini and also one in Bekasi. Occasionally he’s asked by both Arie Parikesit and Bondan Winarno to present his wonderful rujak es krim for food festivals to as far as Kalimantan! So, if you haven’t tried this street dessert, spend some time going to the east and enjoy one of the finest from this part of Jakarta.